Waterfall Bridge is another one of the classic and majestic Rockefeller bridges, completed in 1925 and spanning roughly 120 feet. 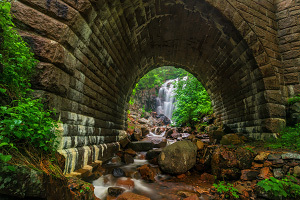 Located only a stone's throw east of the equally impressive Hemlock Bridge, Waterfall Bridge is situated along Hadlock Brook just downstream from the 40-foot tall Hadlock Falls which flows through its skewed arch. One of the most iconic views and photo opportunities in Acadia is to peer through the arch to view the waterfall. Four buttress-like viewing platforms also encourage visitors to take a break and enjoy the scenery. 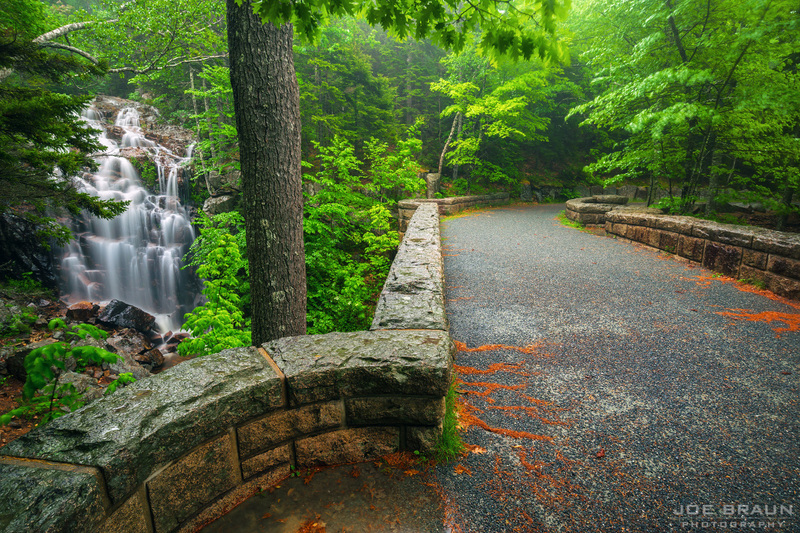 Several parking areas provide relatively easy access to Hemlock Bridge and Waterfall Bridge, including the Parkman Trailhead and the Norumbega Trailhead. 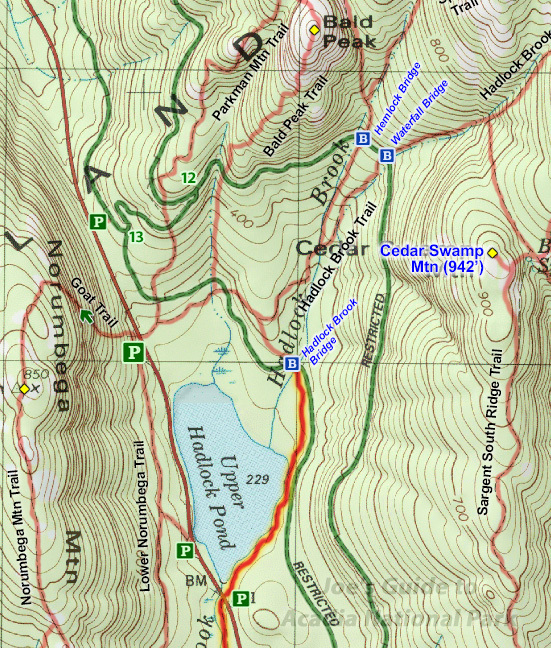 You can hike or bike the carriage roads directly to the bridges, or hikers can pay a visit during hikes along the neighboring trails, including Bald Peak and Parkman Mountain as well as the Hadlock Brook Trail and Maple Spring Trail. 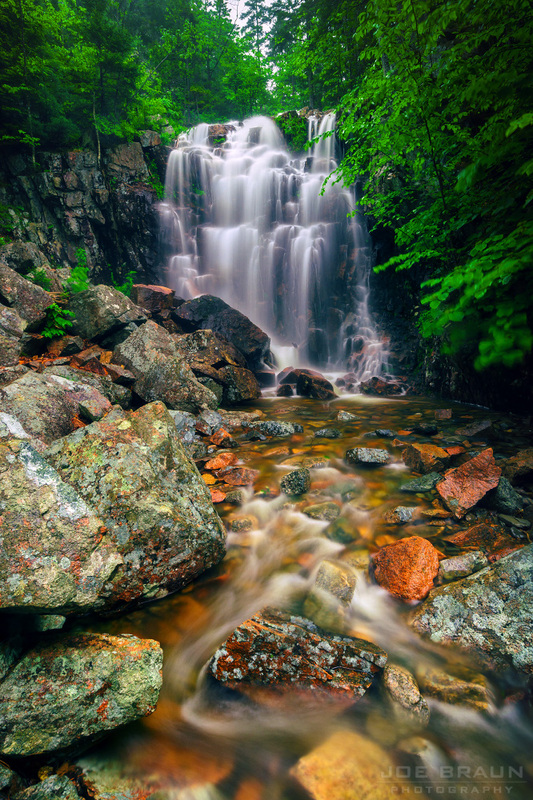 Please note that most of Hadlock Brook's flow comes from spring runoff, so the waterfall is sometimes just a trickle during the drier months later in the year.